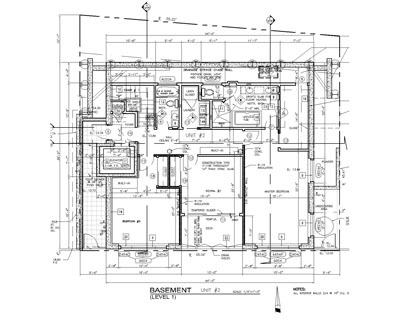 Custom Homes Projects – RPP Architects & Associates Inc. The Downey mansions are a clear reflection of the big dreams of RPP Architects’ clients. Approximately 5,000 Sq. Ft. to 10,000 Sq. Ft., usually 5 bedrooms and 5 bathrooms, all featuring port cosheres, vaulted ceilings, circular staircases, home theaters, tennis courts, and swimming pools. 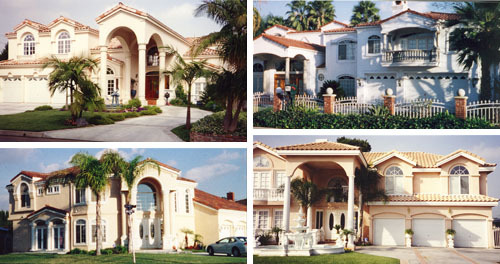 The Mediterranean-inspired exteriors feature prominent two story entry elements, arches, columns, and tiled roofs. Nested high above the Pacific, this California hillside courtyard home overlooks the ocean coast from Newport Beach to the Palos Verdes peninsula. The residence has approximately 4,600 Sq. Ft., divided between 5 bedrooms, 5.5 bathrooms, a library, office, and a 3 car garage with a motor court. The designer, Bozena Jaworski, maximized the project potential and succeeded, despite strict view protection restrictions. With a design respectful of the adjacent homes’ ocean views, carefully crafted roof lines and sensitively designed massing create an exiting spatial composition, with an aesthetically pleasing streetscape. The side entry courtyard elevated bridge crossing over the moat-like area invite guests through a broad archway to the ornate wrought iron entrance. The second floor main entry tower links a private master suite entry vestibule, the living room, and casual living areas with a gallery hall. All of the spaces on the top level are open to the shaded wraparound balconies and expansive terrace with panoramic vistas. 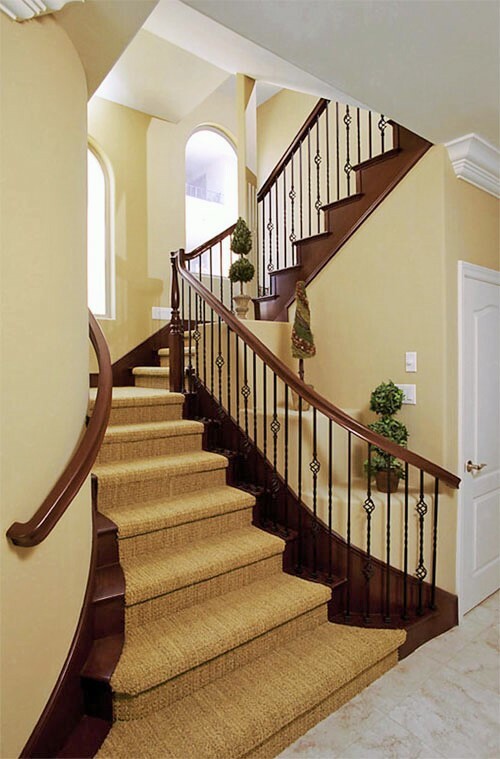 The curved staircase leads down to the lower level sleeping quarters and family entertainment center, extended visually into the landscaped courtyard. The master suite turret allows for interrupted 270 degrees coastal view. This project is the best example of RPP helping its client to realize the unique objectives of their project. The design was centered around the client’s goals, with an ocean view and site planning for two luxury condominiums, as well as compliance with the local View Protection Ordinance. The design encompasses two Tuscan style residences flanking a compact interior court yard. A romantic gated tower entry in the front residence leads through an inner intimate courtyard to a formal front paneled door. The tower’s second floor loggia, accessible through a bridged deck, is optimal for ocean views, and provides a serene place of meditation quality. 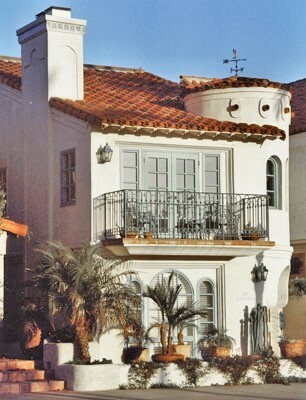 The second residence, located on the back of the lot, features views of the coast from the secluded second floor balcony. 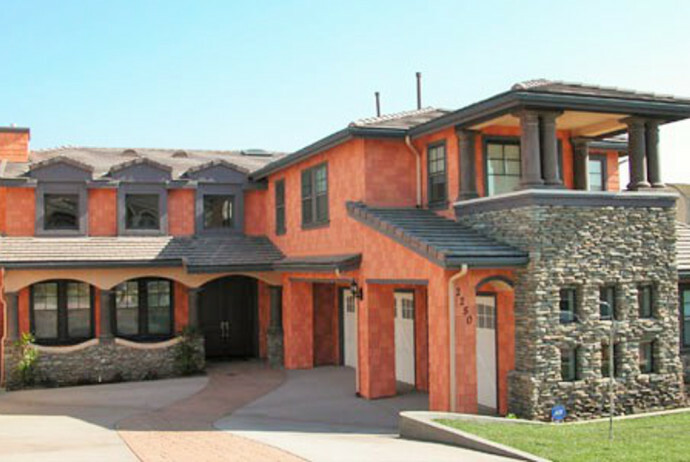 Varied low-pitched red tile roof lines, stone veneer, decorative railings, and wrought iron artwork all establish a comfortable garden atmosphere. 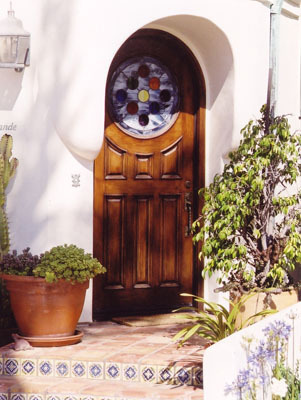 The twentieth century Tuscan-inspired style is far more reaching than just that, incorporated elements from the European Renaissance, Moorish, and various Mediterranean styles. Materials of stone and earthen palettes gives the home the illusion of being one with the landscape. This residence is RPP Architects’ best example of how our custom home design is focused on reflecting the needs and personality of the client. The designer committed to create a house design integrated with the hillside, minimizing view impact to the surrounding residents and capturing dramatic ocean views at the same time. 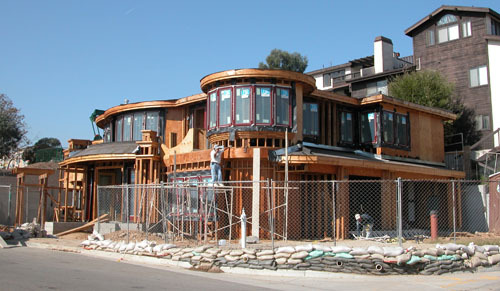 The curved stucco walls provide a feeling of continuity that links the different areas of the home. Wavy decks wrap around cylindrical shapes of structure, capturing 180 degrees of ocean view. Railing spruced with mosaic and curvy shapes glass reinforces the flow of the forms in an organic manner. The rooms, which capture views and natural light, are covered with numerous fixed and operable glass windows. The residence is approximately 4,500 Sq. 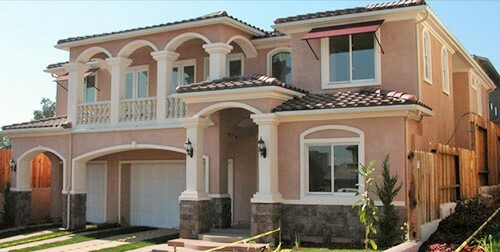 Ft., with 4 bedrooms, 4 bathrooms, an office, and a 3 car garage.